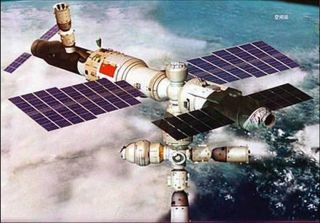 An artist's depiction of China's first space station, a 60-ton orbital complex, after its assembly is complete in 2020. The successful landing of China's latest manned space mission in June cast a spotlight on the country's growing human spaceflight skills as it hones the capabilities needed to build a huge, permanently crewed space station. During the 15-day Shenzhou 10 spaceflight, three Chinese astronauts accomplished both automatic and manual dockings to China's Tiangong 1 space laboratory, where they lived and worked during the mission. The crew also achieved a two-hour-long fly-around of the module, a first in space for China seen an effort to sharpen rendezvous expertise useful for future space station construction. The Shenzhou 10 crew made a parachute landing early Wednesday morning (June 26) local time, setting down within a target zone in the central Inner Mongolia, with the three astronauts — commander Nie Haisheng, Wang Yaping (the second Chinese woman to fly in space) and Zhang Xiaoguang — leaving the landed module safe and sound. The crew of Shenzhou 10, China's fifth human spaceflight mission, salutes after a safe landing in inner Mongolia on the morning of June 26 local time in 2013. The crew is, from left: Zhang Xiaoguang, Shenzhou 10 commander Nie Haisheng and Wang Yaping, China's second female astronaut. In a post-landing press conference, Wang Zhaoyao, Director General of the China Manned Space Agency, said, "With a complete success of this spaceflight mission as a milestone, China's manned space program will enter into a new phase of manned space station construction." According to a report from the Asia News Network, Wang said the country would loft the Tiangong 2 space lab around 2015. Three years later, an experimental core space station module would be lofted, he said, with the focus on constructing a 60-ton, multi-module space station for China by 2020. Wang said that between 2015 and 2020, a series of cargo and piloted spacecraft would deliver supplies and transport astronauts to the space lab and space station. To date, Wang said China has invested 39 billion yuan (U.S. $6.35 billion) in its human spaceflight program since it began in 1992. As reported by the Xinhuanews agency, China's Vice Premier, Zhang Gaoli wrote a congratulatory letter to the Shenzhou 10 space team, stating, "The complete success of [the] Tiangong 1 and Shenzhou 10 mission has further consolidated China's space rendezvous and docking expertise and marked a great staged success in achieving the second-phase target of the nation's manned space program." Shenzhou 10's Wang Yaping, the second Chinese female astronaut to fly in space, took on the role of teacher in space. She gave a live space video lesson to Chinese students from Tiangong 1, the first lesson of its kind in China. Aided by her Shenzhou 10 crewmates, Wang carried out experiments that demonstrated such things as pendulum movement and gyroscopic motion. She also created a water bubble to illustrate the surface tension of water in space. Wang interacted with students on the ground via live video communication. According to the China Manned Space Engineering Network, more than 60 million students and teachers from 80 thousand high schools all over China watched the live video. Chinese President Xi Jinping came to the Beijing Aerospace Control Center (BACC) on June 24, 2013, and spoke with the three astronauts aboard the Tiangong-1 orbiter. China set out an ambitious plan for human spaceflight in 1992, said Joan Johnson-Freese, professor of national security affairs at the Naval War College in Newport, R.I. The country is executing that plan in incremental steps, Johnson-Freese told SPACE.com, "clearly demonstrating its commitment to being a serious spacefaring nation, its patience in meeting goals, [its] technical prowess and political will." Johnson-Freese said that China is not doing anything technically beyond the reach of the United States. In fact, the United States successfully executed those technical accomplishments almost 50 years ago. "But what China has today that the U.S. does not is patience and political will," Johnson-Freese said. "What to watch for now is the debate going on within China regarding whether to combine the accomplishment of the Shenzhou program and the robotic lunar exploration program, Chang’e, toward a human mission to the moon," said Johnson-Freese. Johnson-Freese said that a number of officials and scientists in China share the same concerns that scientists in the United States had prior to Apollo — that is, too many scarce scientific resources would go to one program. "But with the success that China has had with the Shenzhou program, in areas from economics to geopolitics and advanced dual use space technology useful to the military, my guess is they will eventually approve a human spaceflight mission," Johnson-Freese concluded. An exterior camera on China's Tiangong 1 module captures the approach of the Shenzhou 10 spacecraft as it nears the space laboratory during a 15-day spaceflight , China's longest yet, in June 2013. Reacting to the successful completion of the Shenzhou 10 space trek is Dean Cheng, a research fellow on Chinese political and security affairs at the Heritage Foundation in Washington, D.C.
"The Chinese have staged yet another successful manned shot. A reflection of the steady maturing of their program, and marking a decade of the Chinese sending people into space," said Cheng. Cheng said that for China's space program and its top leadership, it is an opportunity to look back with justifiable pride in their accomplishments. "It also reflects the sustained, long-term interest and top-level support that China's manned space program has enjoyed," he told SPACE.com. Not surprisingly, Cheng said, the Shenzhou 10 mission, coming in the earliest days of the Xi Jinping administration, provides the new Chinese leadership with an opportunity to bask in glory. "It is no accident that Xi refers to the Chinese space program as part of the 'China Dream,' the catch-phrase at this point he is using for his time in office," he said. Looking into the coming several years, Cheng said to expect to see progress on a new Chinese observation satellite, as well as the Long March 5 rocket and the unveiling of China's new Hainan launch center. What remains unclear, however, is what the next, short-term steps will be for the Chinese manned space program, Cheng said. With a space station scheduled by the end of the end of the decade, what will be the intermediate steps? What will Tiangong-2 look like, for example? "And, sadly, certain things have not changed," Cheng said. "China's space program is little more transparent now than a decade ago. Basic elements, such as budget, organization, administrative chains of command, all remain unclear, at best."